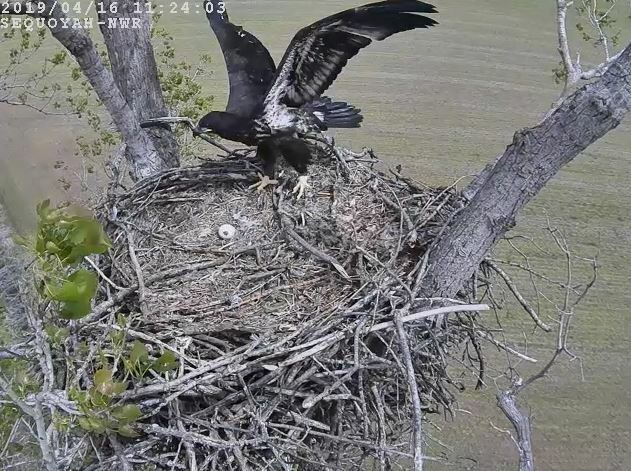 16 April 2019: The eaglet is exercising its wings regularly in preparation for leaving the nest within the next few weeks. 2 April 2019: Stretching feels good! 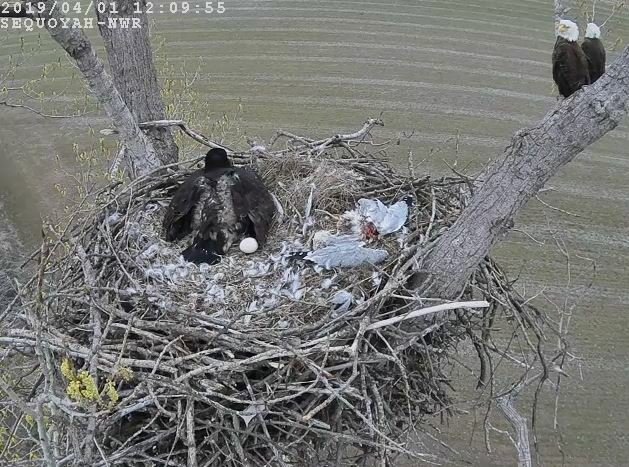 1 April 2019: A little bit of gray down is still present on the chick along its back, as visible here, but the dark brown juvenile feathering is now almost complete. 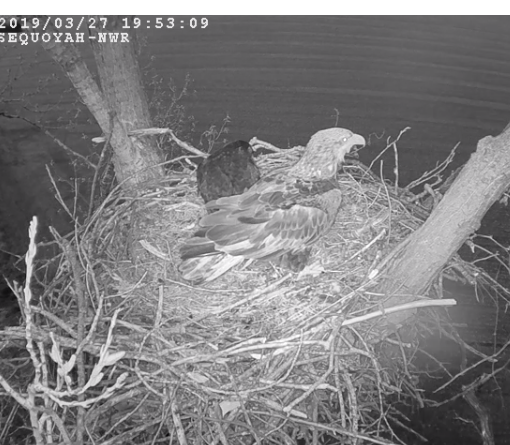 27 March 2019: A subadult eagle landed on the nest and began eating leftover food. 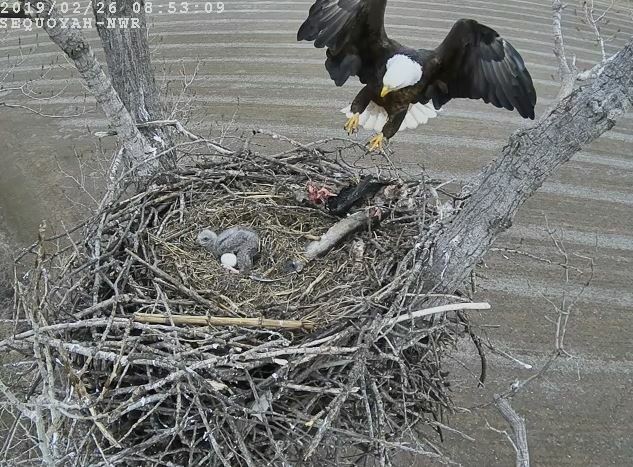 Before long, one of the adults flew in to aggressively displace the intruder! 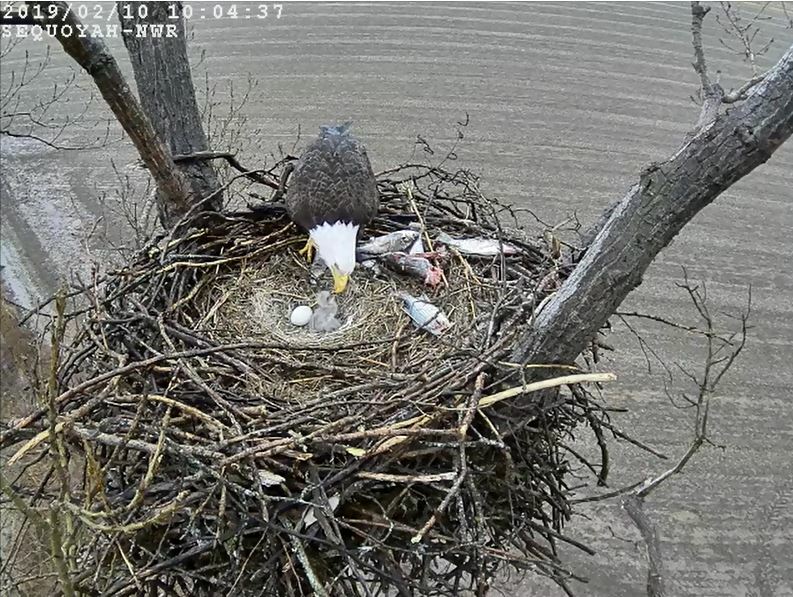 13 March 2019: It is a wet day at the nest! 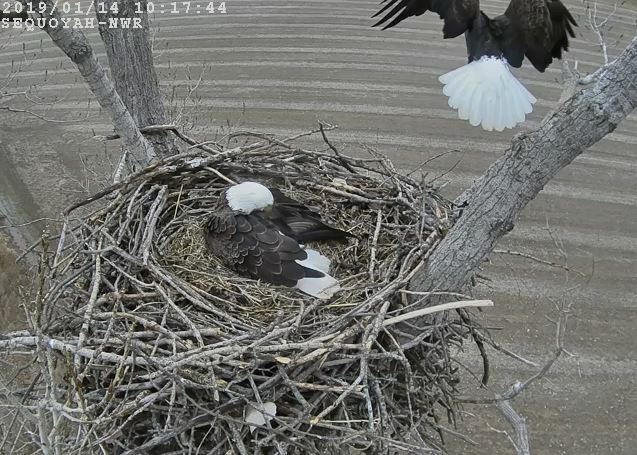 11 March 2019: More and more feathers are appearing as dark blobs within the chick’s coat of gray down. 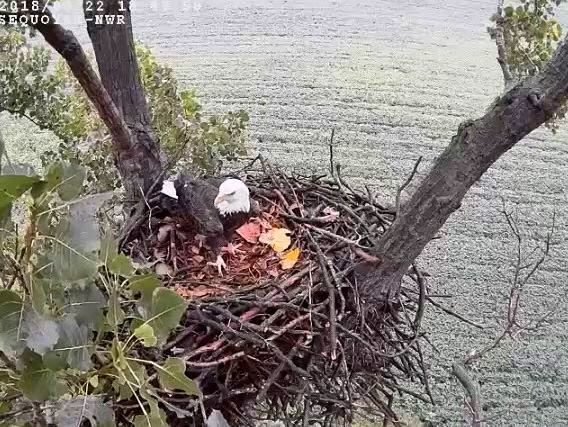 4 March 2019: Feed me! 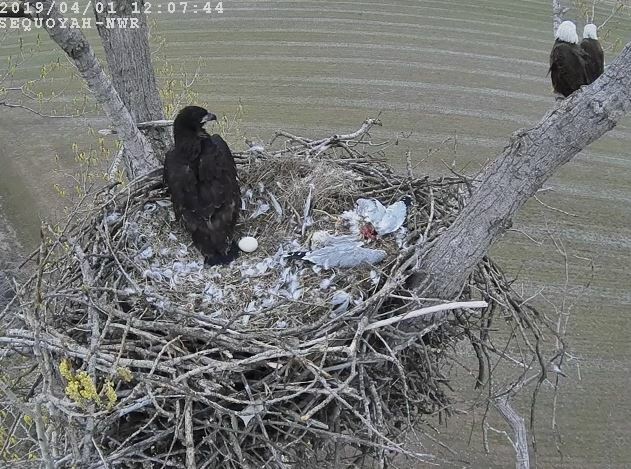 The chick has grown substantially in the past week, and can spend a little more time uncovered, even with the chilly weather. 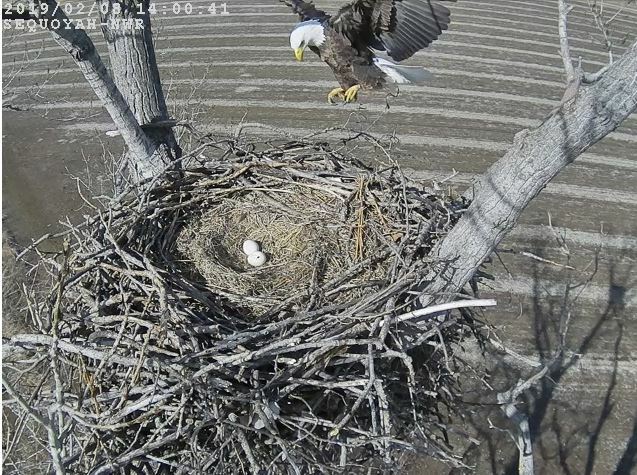 26 February 2019: An adult returns to the nest after a short break away. 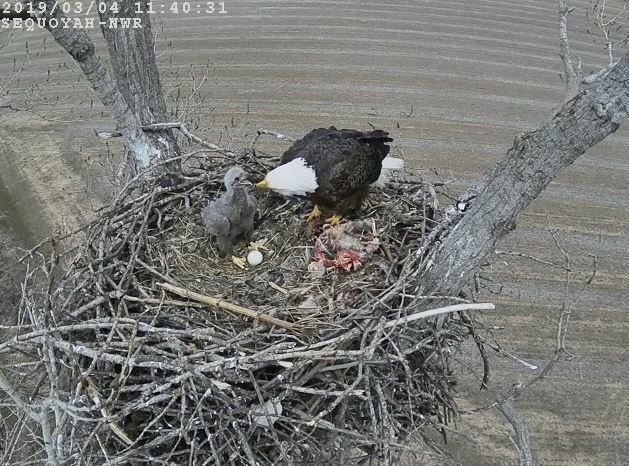 21 February 2019: While the majority of time is spent brooding the young chick at this stage of the nesting cycle, the chick is fed a number of times each day, which provides good viewing opportunities. 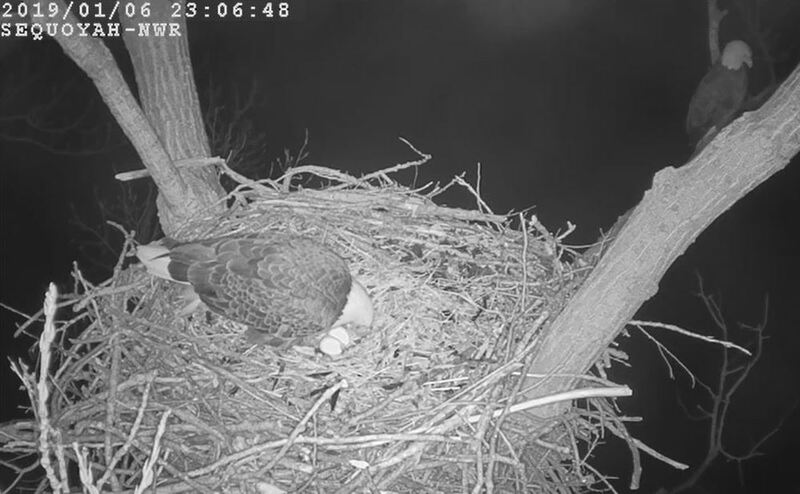 18 February 2019: Feeding time at the nest. 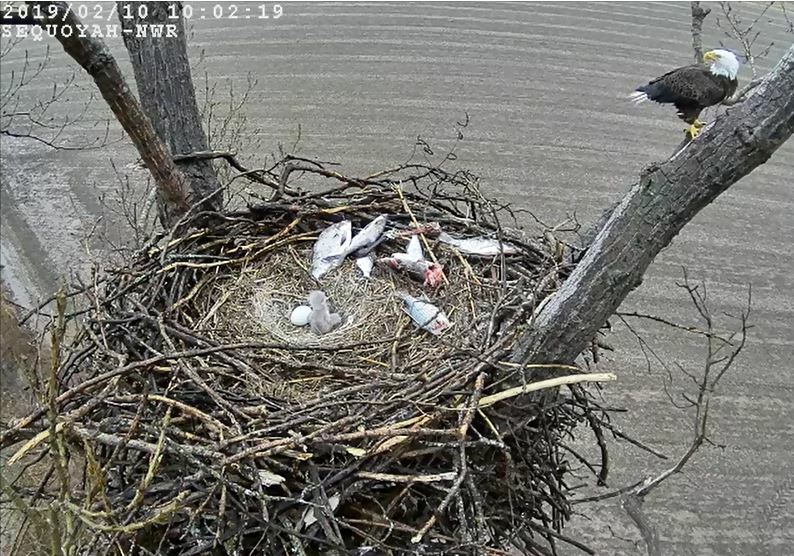 10 February 2019: The new arrival has more fish than it can eat for quite some time! 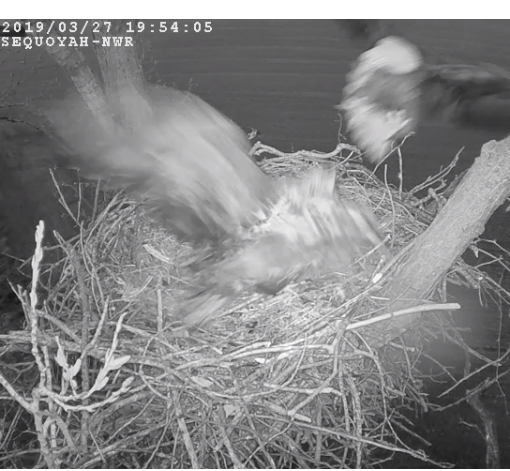 8 February 2019: While the first egg has likely failed, it looks like the second has been pipped! And food is arriving! 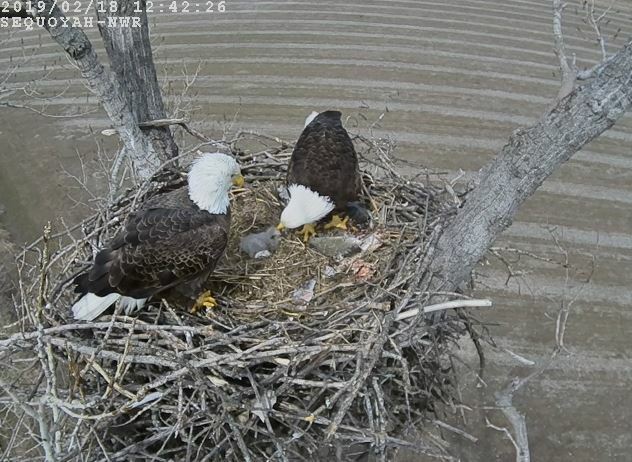 7 February 2019: Still two eggs! 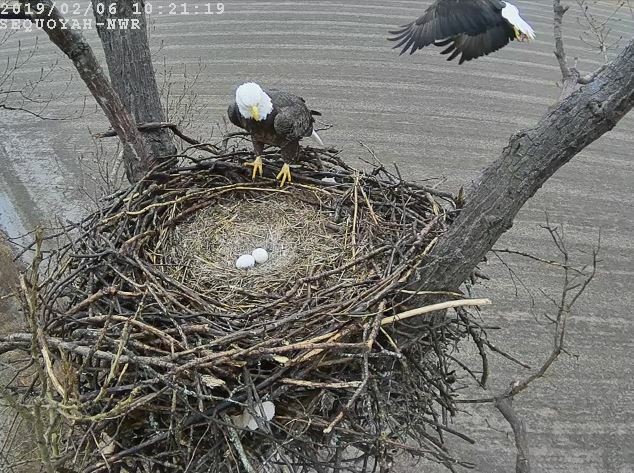 6 February 2019: Still two eggs! 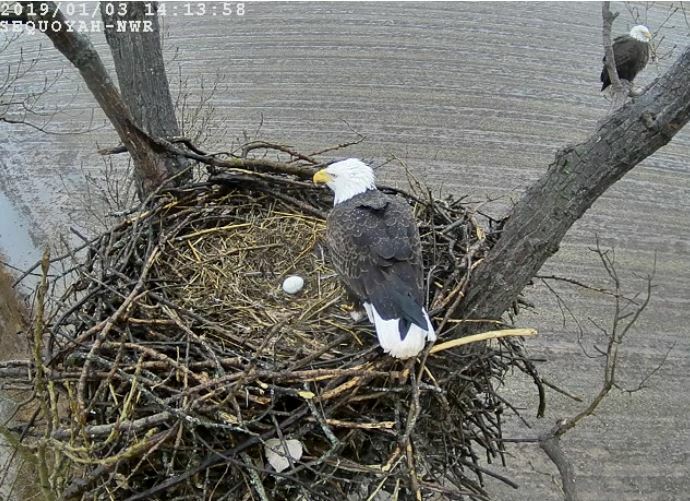 5 February 2019: Waiting for the first egg to hatch! 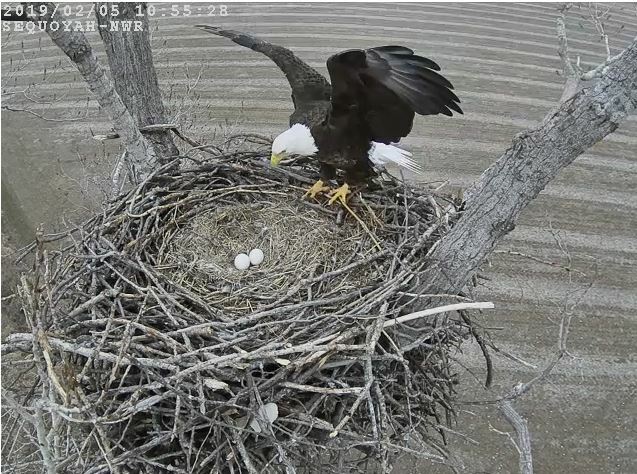 29 January 2019: All appears well at the nest, with incubation of two eggs continuing. 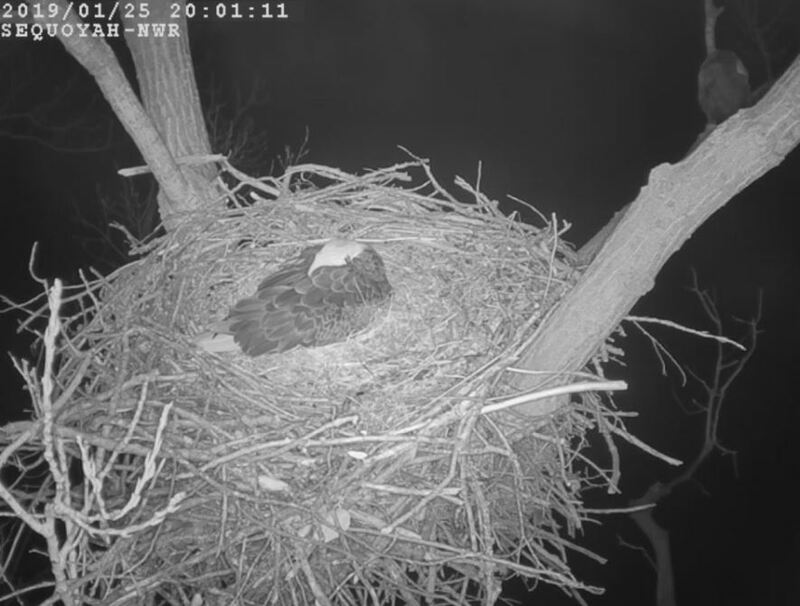 25 January 2018: Nighttime incubation and roosting on a nearby branch. 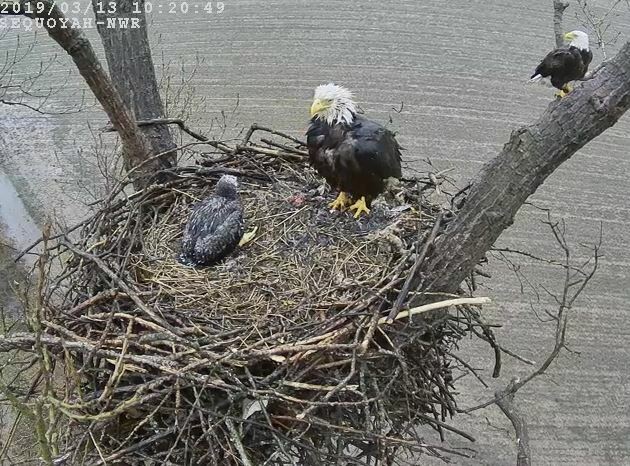 18 January 2019: Another mild day at the eagle nest, but it is about to turn colder tomorrow. 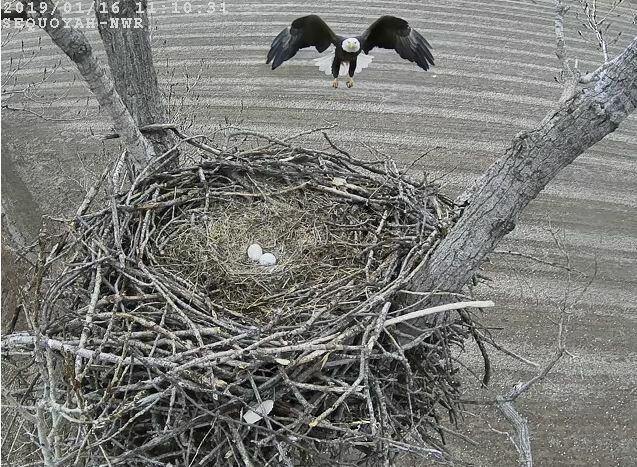 16 January 2018: After a short break, an eagle returns to resume incubation. 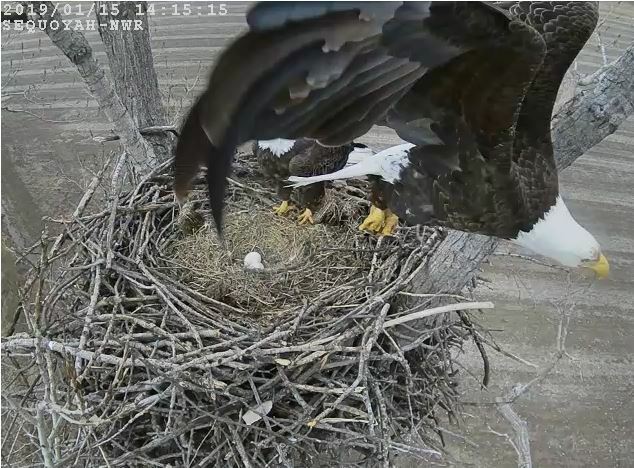 15 January 2019: Here is an action shot of one adult leaving while the other takes over incubation. 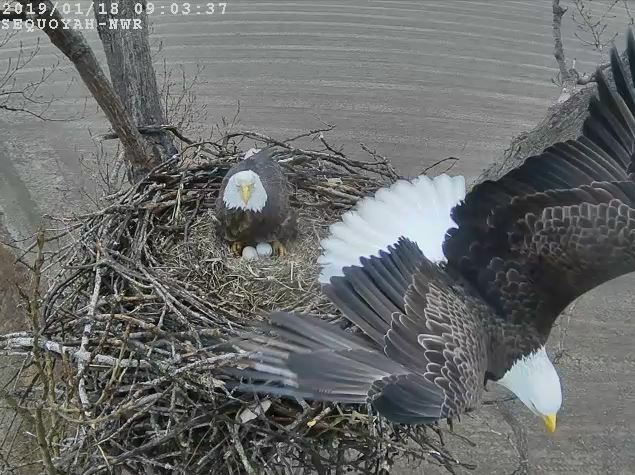 14 January 2019: Incubation of two eggs continues. 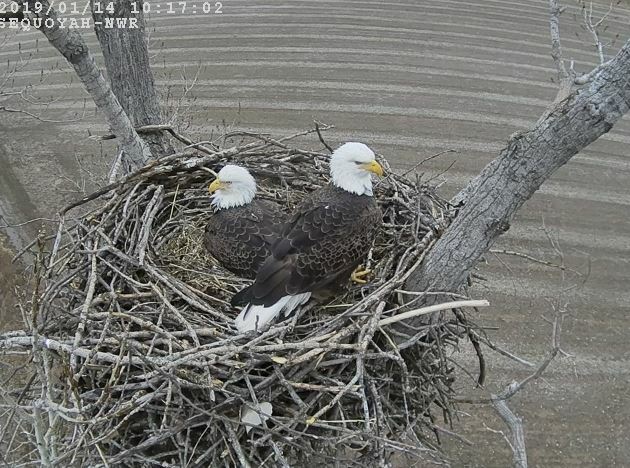 One picture shows both adults at the nest, while the other shows one bird preening after taking over incubation duties while the second bird flies off to a nearby branch for a break. 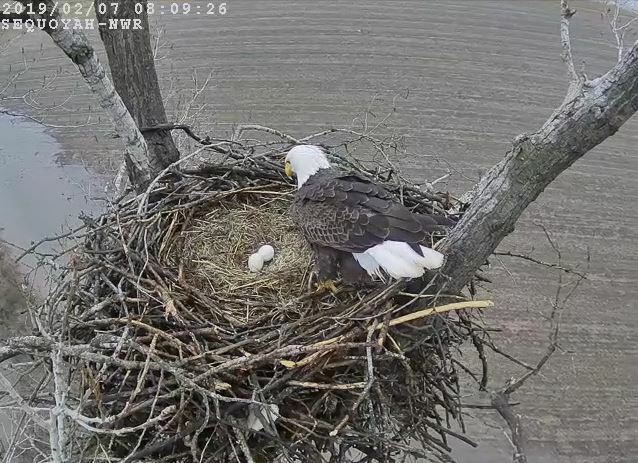 7 January 2019: A second egg was laid the evening of January 6! 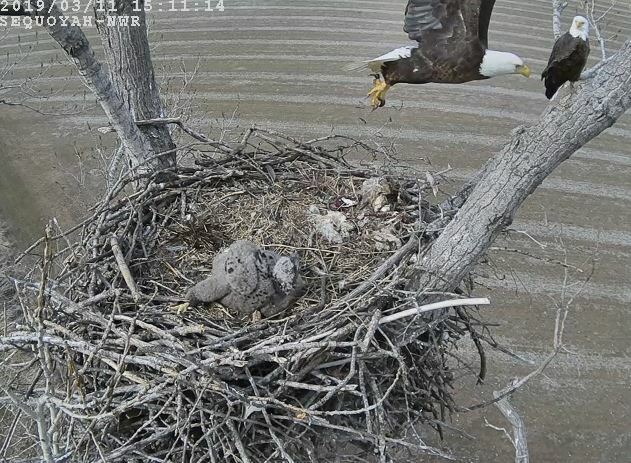 4 January 2019: Two adults at the nest with one egg. 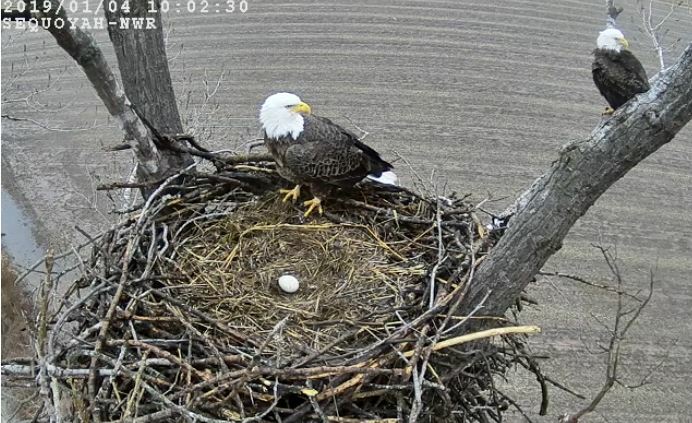 And a photo of turning the egg for incubation. 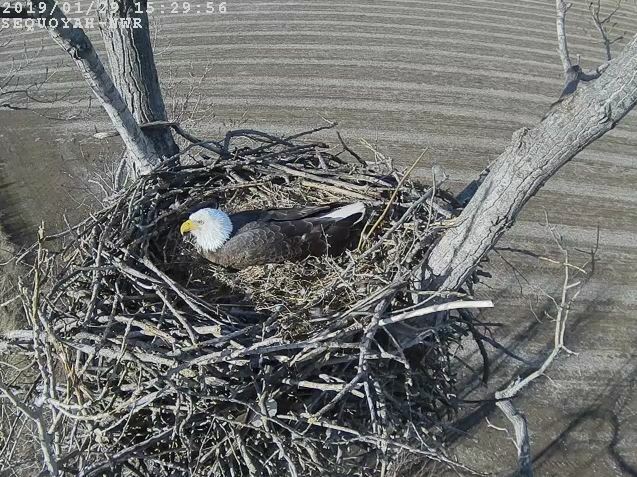 Bald Eagles begin incubating when the first egg is laid. 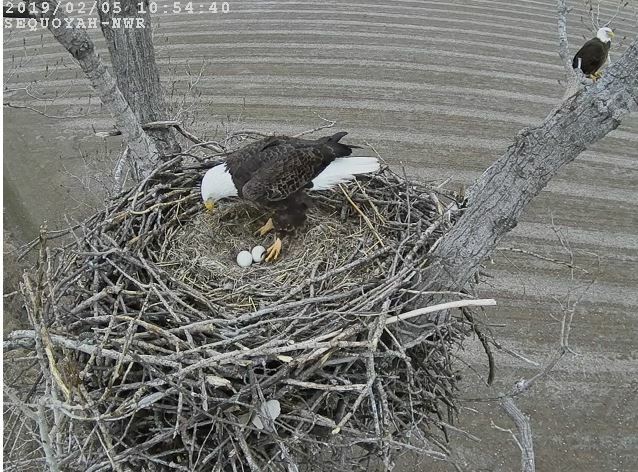 Any subsequent eggs laid a few days apart then hatch at later dates than the first egg, and the chicks will be slightly different ages and sizes. 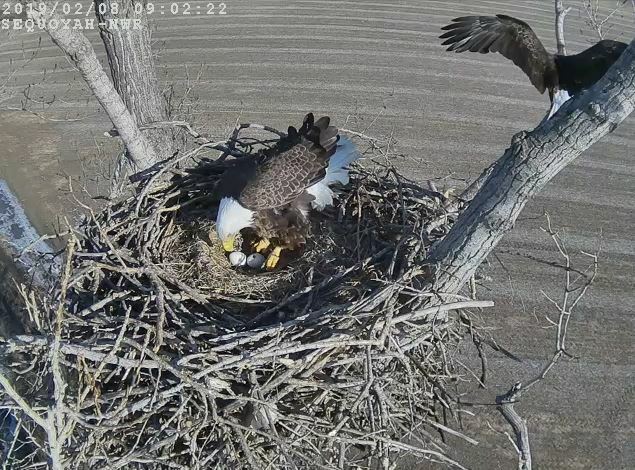 This incubation strategy differs from some other birds such as quail, which start incubating when their full clutch is complete and all chicks hatch at about the same time. 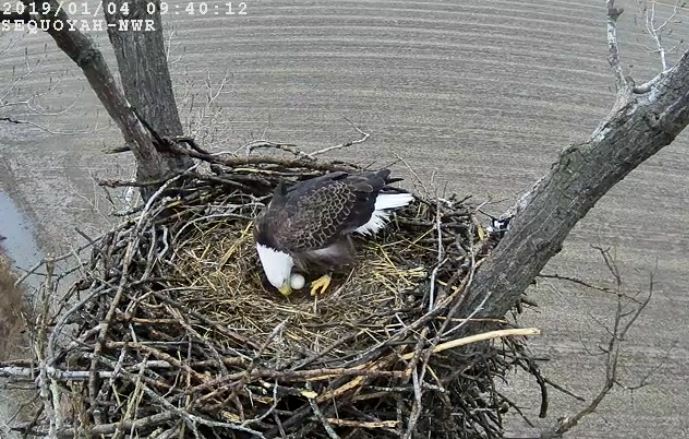 3 January 2019: The first egg is here (as of yesterday), on a cold and rainy day for incubation! 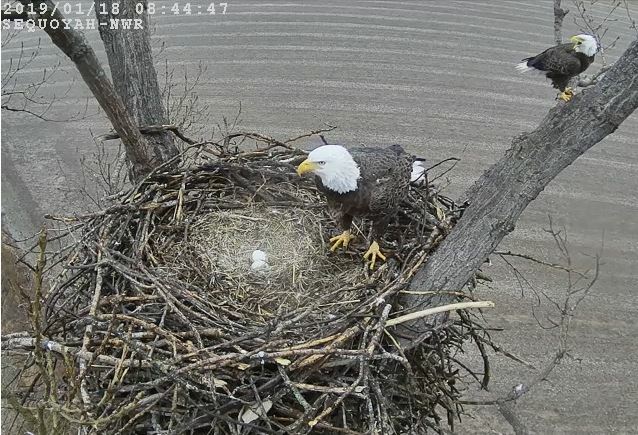 September 2018: We have replaced the broken camera at Sequoyah NWR in preparation for the 2019 nesting season. 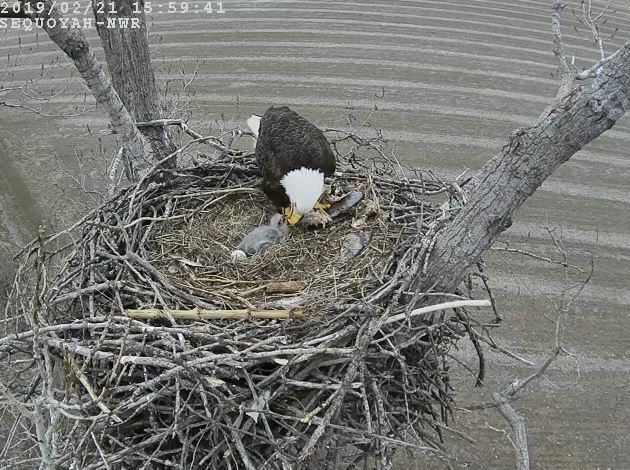 Now we are hoping that the eagles decide to use this nest once again! We should know sometime in November or December. 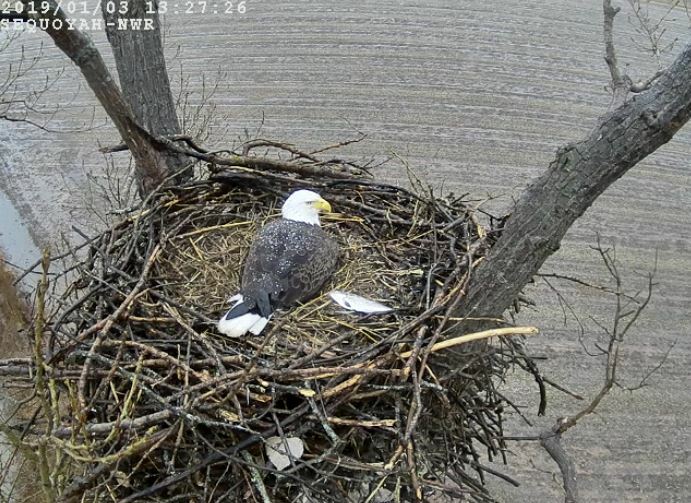 Here is a photo from 22 September of an adult at the nest. 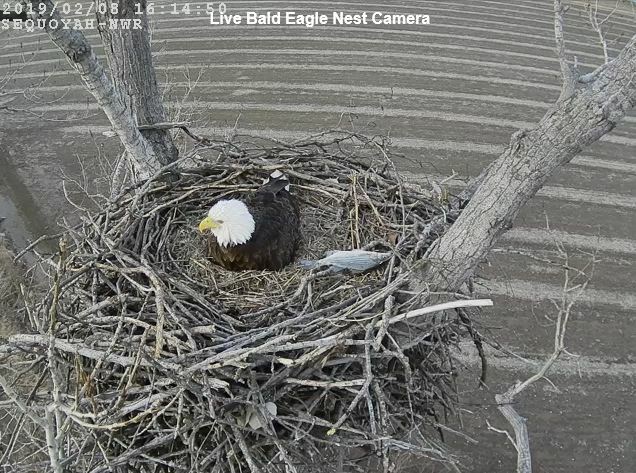 Adult Bald Eagle visiting the nest during the off season. 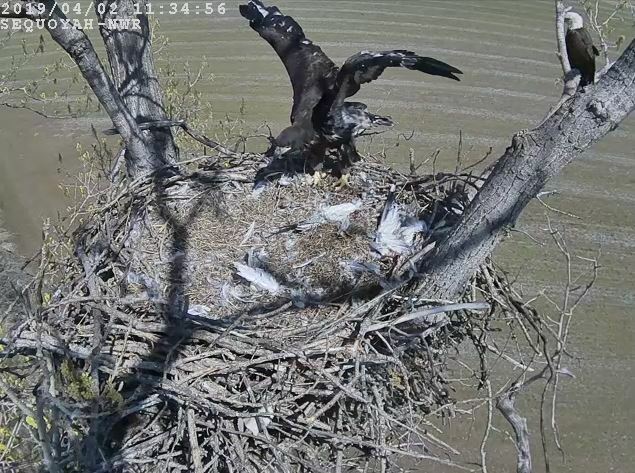 Please click to enjoy this collection of “greatest hits” images from Sequoyah NWR in previous seasons.